Greenfyre is the Internet blog and screen name for a radical environmental activist, Mike Kaulbars from Ottawa, Canada. He is a founder of the Earth First! chapter in Ottawa, Canada, an eco-terrorist organization with a long history of violence and sabotage. In a few weeks I, and 50 others are off to jail. ...I do what I do because of a "pure, true love for the Earth." Mike Kaulbars, a founder of the Earth First! chapter in Ottawa, says his group has about 20 "hard-core" members, and perhaps 80 who are drawn in for special events such as protests. EF! 's militant message was supported by a Harvard-educated Montana recluse named Ted Kaczynski (later to be known as the "Unabomber"), who mailed dozens of letter bombs, killing three and wounding 28. After raiding Kaczynski's cabin in 1996, FBI agents discovered several volumes of the Earth First! Journal. Also found was a publication called Live Wild or Die, which was financed by EF! 's co-founder Mike Roselle and featured a catalogue of the environmentalist movement's most hated, the so-called "Eco-F*cker Hit List." Prominent on this list was the Exxon oil company. A February 2, 1994, article in the Earth First Journal! erroneously claimed that a firm called Burson-Marsteller was in charge of Exxon's public relations efforts in the wake of the Exxon Valdez oil spill. Kaczynski is believed to have sent the mail bomb that killed Thomas Mosser, an executive with Burson-Marsteller, at his New Jersey home December 10, 1994. Declaring that it believes in "using all the tools in the tool box," EF! today affirms its continued commitment to "monkeywrenching." In 2001, EF! activist John Stephens said that arson attacks were on the whole "a positive thing" for environmentalist groups to undertake. In his own book, Confessions of an Eco-Warrior, Foreman brags: "A major accomplishment of Earth First! … has been to expand the environmental spectrum to where the Sierra Club and other groups are perceived as moderates." Earth First members have little use for tactics of the Sierra Club and other mainstream groups - they call them ''couch potato environmentalists'' -who concentrate on letter-writing campaigns, lobbying and lawsuits. Vandals identifying themselves with the militant environmental group Earth First have forced the closing of a new golf course by writing messages on the greens. Using a chemical that the authorities have yet to identify, the vandals wrote, "Earth First!," "Hayduke lives" and "Ron you pig" on 11 greens and several tees at the course sometime last week, Undersheriff Sky Walters said Friday. Three weeks ago The Telluride Times Journal received a letter signed "Earth First" saying the development's high-speed ski lift had been sabotaged. The letter writer said a welding gas that weakens metal had been applied to the lift cable. Mr. Davis acknowledged his actions and told the judge that he took responsibility for them. But he also said he had been trying to protect himself and others against what he saw as the potentially deadly danger of nuclear plants. Monkeywrenching: Ecotage, ecodefense, billboard bandits, desurveying, road reclamation, tree spiking, even fire. All of these terms describe the unlawful sabotage of industrial extraction and development equipment, as a means of striking at the Earth's destroyers where they commit their crimes and hitting them where they feel it most—in their profit margins. Monkeywrenching is not mindless—targets are carefully picked for their strategic value. There is a time and a place for everything. Knowing when not to engage in sabotage is equally of value. For in stance, monkeywrenching during public civil disobedience jeopardizes all who are present. 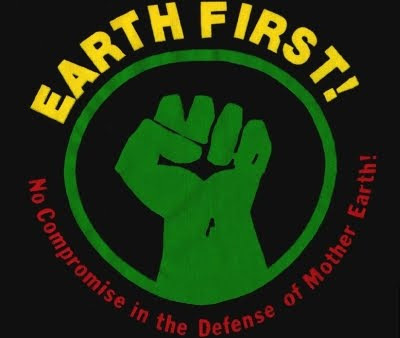 Although some individual Earth First!ers may be active monkeywrenchers, the Earth First! movement officially neither advocates nor condemns monkeywrenching. Ecodefense: A Field Guide to Monkeywrenching (available from the Earth First! Journal) contains detailed information on monkeywrenching techniques as well as discussions of security, safety, strategy and justification. Caption: "Visiting an Embassy to discuss logging and first nations; for some reason their gates were all locked shut..."